dBiostatistics Design and Analysis Center (L.Z. ), Clinical and Translational Science Institute, University of Minnesota, Minneapolis, Minnesota. Organizational chart of inclusion of 101 patients with ATL in this study. 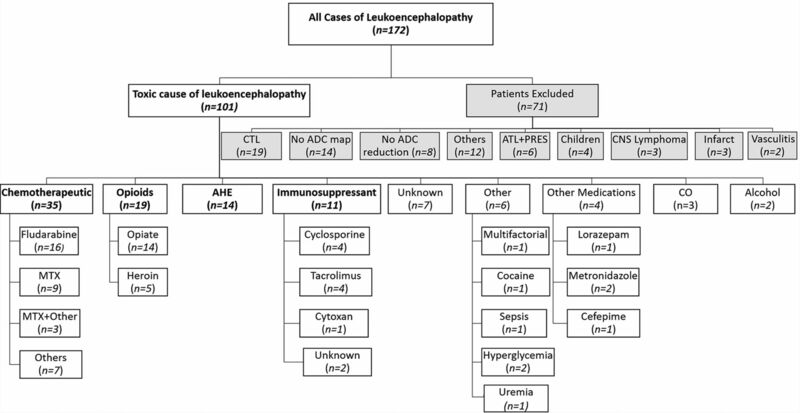 MTX = Methotrexate; CO = carbon monoxide; CTL = Chronic toxic leukoencephalopathy; ATL+PRES = Acute toxic leukoencephalopathy with concomitant posterior reversible encephalopathy syndrome. 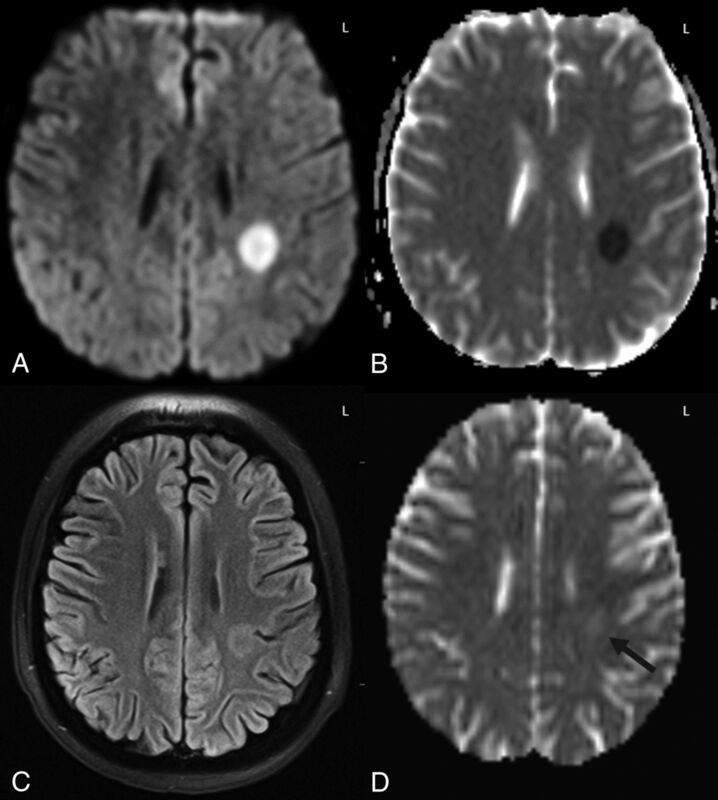 Example of grade 1 DWI-FLAIR ATL severity. A 16-year-old girl with acute leukemia after 5 days of high-dose cytarabine and clofarabine combined chemotherapy, presented with acute right upper extremity weakness. An initial head CT (not shown) was unremarkable. 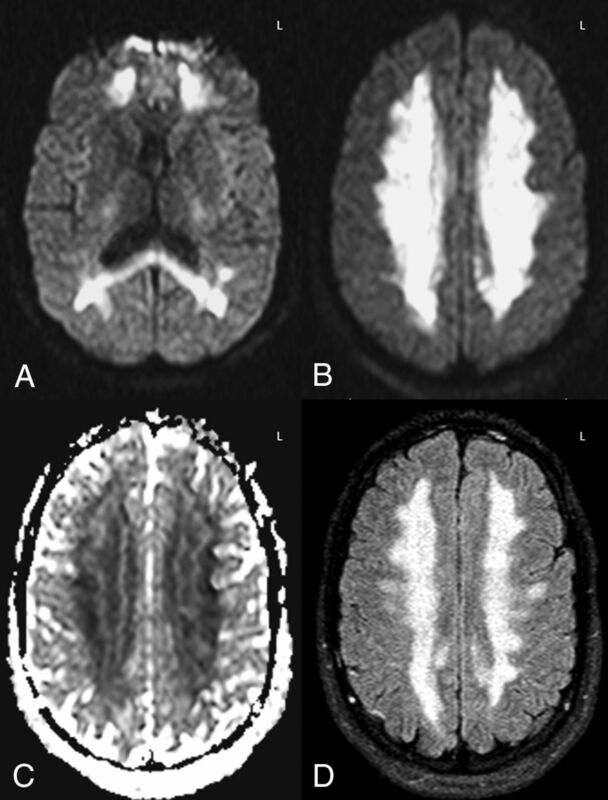 On DWI (A) and ADC (B), unilateral diffusion reduction was present in the left PVWM with 60% ADC loss compared with NAWM and corresponding faint FLAIR hyperintensity (C). Accompanying MRA study (not shown) was normal. D, On follow-up MR imaging at 2 weeks after withdrawal of the chemotherapy, there was normalization of diffusion reduction with faint residual hyperintensity on DWI (not shown), ADC map (D, black arrow), and FLAIR (not shown), with a resultant T2-shinethrough effect on DWI. The symptoms had resolved at long-term clinical follow-up with both the ATLOS and mRS clinical scores being 0. Example of a grade 2 DWI-FLAIR ATL severity from uremia. A previously healthy 16-year-old boy with coma had renal failure of unknown cause, blood urea nitrogen level of >115 mg/dL (normal <25 mg/dL), creatinine level of 18.34 mg/dL (normal, <1.2 mg/dL), glomerular filtration rate of 5 (normal, >90), and systolic blood pressure of >160 mm Hg. 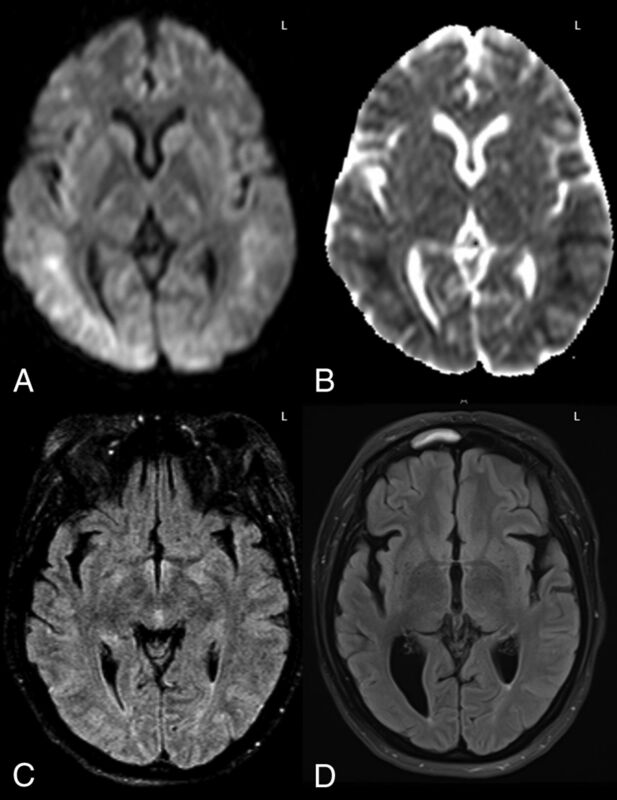 MR imaging revealed PVWM abnormalities sparing the basal ganglia on DWI (A and B), with a normal appearance on FLAIR (C) and normal MRA (not shown). Laboratory work-up only revealed uremia. Clinically, the symptoms resolved with dialysis, and MR imaging 2 days later (not shown) noted continued diffusion reduction, while the ADC values rose with complete resolution of symptoms (the ATLOS and mRS scores were 0). A 40-year-old woman with altered mentation 1 month post-liver transplantation, who was immunosuppressed with tacrolimus. MR imaging demonstrated extensive diffusion reduction bilaterally in the PVWM and subcortical white matter on DWI and ADC (A and B), with 58% ADC loss (versus NAWM) and slight hyperintensity on FLAIR (C) involving 3 lobes, consistent with grade 3 ATL imaging severity on DWI and FLAIR. Note that there was no apparent cortical edema on FLAIR to suggest PRES. After the withdrawal of tacrolimus and supportive therapy, the long-term ATLOS and mRS scores were both 0. D, An MR imaging 12 years later (obtained for chronic headaches) showed mild-moderate right PVWM loss and ex-vacuo dilation of the occipital horn of the right lateral ventricle as sequelae of ATL, without cortical encephalomalacia. Example of opiate-related grade 4 DWI-FLAIR ATL severity. A 26-year-old comatose man with urine toxicology positive for propoxyphene (an opioid analgesic) had diffuse and confluent DWI-ADC (A–C) and FLAIR (D) abnormalities with 67% ADC loss versus NAWM. The patient had moderate long-term neurologic sequelae, with the ATLOS at 1 month being 2 and the mRS at 3 months being 3. Follow-up MR imaging was not performed. 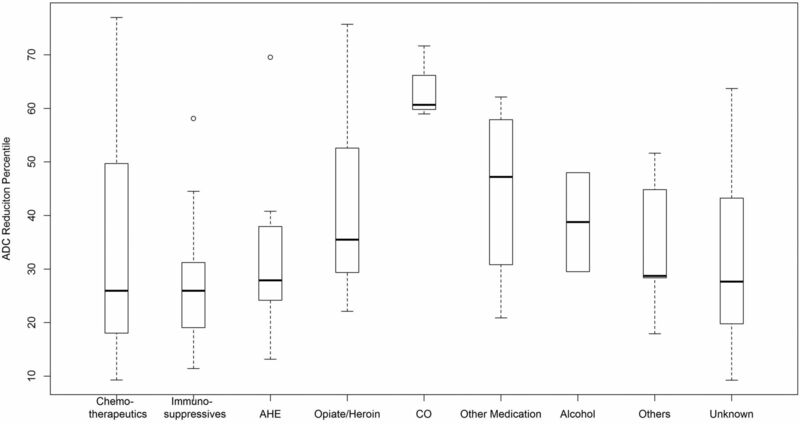 Boxplot of each etiologic subgroup with the percentage ADC reduction of affected regions compared with NAWM. ATL from carbon monoxide (CO, a small subgroup of 3) had a much greater percentage ADC reduction versus the other subgroups. Note:—CTX indicates Chemotherapeutics; O/H, Opiates/Heroin; AHE, Acute Hepatic Encephalopathy; ID, Immunosuppressive drugs; PM, Prescribed medications; CO, Carbon Monoxide. ↵a Including metronidazole (n = 2), lorazepam (n = 1), and cefepime (n = 1). ↵a Multiple comparisons were adjusted with a Bonferroni correction (P = .0083).